An astute reader might recall the so-called “capacitor plague” from the earlier part of this decade. 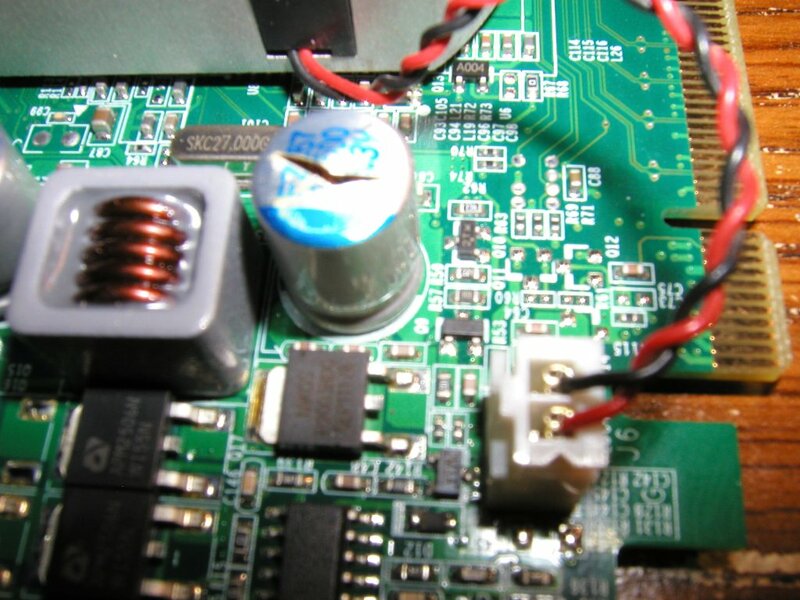 The general consensus holds that the plague of failing capacitors originated from corporate espionage and the theft of an electrolytic formula minus a critical component. Without the critical component–a stabilizer–charge and discharge cycles combined with their respective heating a cooling would eventually generate a build up of hydrogen gas, triggering a potentially catastrophic failure of the capacitor. When I left to finish my studies, I thought that the faulty capacitor problem would be destined to become a distant memory. In December 2006, I built my existing workstation; it was reasonably inexpensive, and I’ve always had an interest in building and integrating the components of my own volition, but I never realized that a fairly critical component would fail about three years and three months later due to precisely the same reason that had kept the guys at MDC insanely busy for months. It was Thursday evening, and I was working on a TurboGears project. As is typical of those evenings when I feel endowed with a sense of adventure enough to explore unfamiliar frameworks, I had a few dozen windows open, some music playing, several SSH sessions, and the likes. I recall that I was exploring some of TurboGear’s internals and was in the process of setting up a template to test a new idea. Then my monitor shut itself off. Over the years, I’ve experienced a few unusual hardware failures, including faulty video cards, but save for a catastrophic event tied to CPU, motherboard, memory, or power supply failures, I’ve never experienced many that would freeze the entire operating system. Everything had frozen; no longer were my speakers playing in the background (I was listening to something in the trance genre) and neither would the machine respond to pings from the file server. It was dead. Nevertheless, a simple software problem can always be solved by popping the reset button, booting back to the operating system at fault, and examining logs for hints that might lead to the apprehension of the bug in question. Once Windows finished starting, I entered my password and waited. As the background appeared and the taskbar was loading, the black screen mysteriously appeared and the system hung. I sat there for a moment perplexed that the same event which was originally responsible for forcing me into troubleshooting mode had returned to haunt me a second time. Worse, there was no evidence of a driver-related BSoD or other kernel-level OS fault (Windows started normally without so much as a prompt to enter safe mode). I knew what to do: Boot to Gentoo, examine the message log for potential clues that might indict a growing hardware problem, and then take a closer look at the Windows partitions for further evidence of possible kernel dumps. I made the decision then to boot Gentoo and waited. A few errors popped up during init that indicated my Windows drive couldn’t be mounted, and neither dbus nor hald were able to start. I wasn’t terribly surprised by the latter, but the former event had me puzzled. dbus and hald were dependent upon a library I had rebuilt some days earlier, and I suspected then that they were linked to the earlier version; certainly nothing a revdep-rebuild wouldn’t fix. But the issue with my Windows drive being unmountable bothered me. Had the drive actually died? There wasn’t any indication of an immediate hardware problem in the device, but it most assuredly could not be ruled out. As I entered my password and waited momentarily for the X session to finally launch, I mulled over the likelihood of a hard disk failure. That had to be it! No matter, I thought, I’d reimage the machine tomorrow and make my determination of a potential storage issue. Yet again, my contemplation was interrupted by a black screen–and a total system freeze. Double-U Tee Eff, question mark. I tapped my fingers on the keyboard. This was unusual, very unusual. Two hard drives failing? Possible, yes, but unlikely. Perhaps the SATA controller on the motherboard had gone on the fritz or was on its death throes. Clearly, something was angry. Very, very angry. I had one more operating system to try. Whatever was happening was far from humorous now. I reached over for a live CD but withdrew my hand only moments before touching the case. That wasn’t going to work if the SATA controller had indeed failed–my DVD drive is also plugged into that same controller! I’d have to dig up an old PATA drive later if I wanted to even consider the possibility of booting to a repair disk. BIOS might have additional clues. One more press of the reset button revealed a more puzzling ending: nothing. No boot. No beeps. No errors. The system was dead. For the rest of that night, I tried a variety of tests and made dozens of attempts to resuscitate the machine. Nothing worked. Not until the morning after I had tested the system’s power supply before I glanced over at the video card sitting on my work bench had the culprits been revealed. The board in question was an EVGA 7600 GS (512MiB RAM) and failed approximately three months after the end of the 3 year warranty period. Of course, it isn’t like I’d actually want to replace it; I was due for an upgrade! It was an interesting find, to say the least! Holy cow… This would’ve made an awesome episode of “Unsolved Mysteries” had you not found the damned thing. Bah… now what am I going to do with the next hour of my life? Well, well, well! 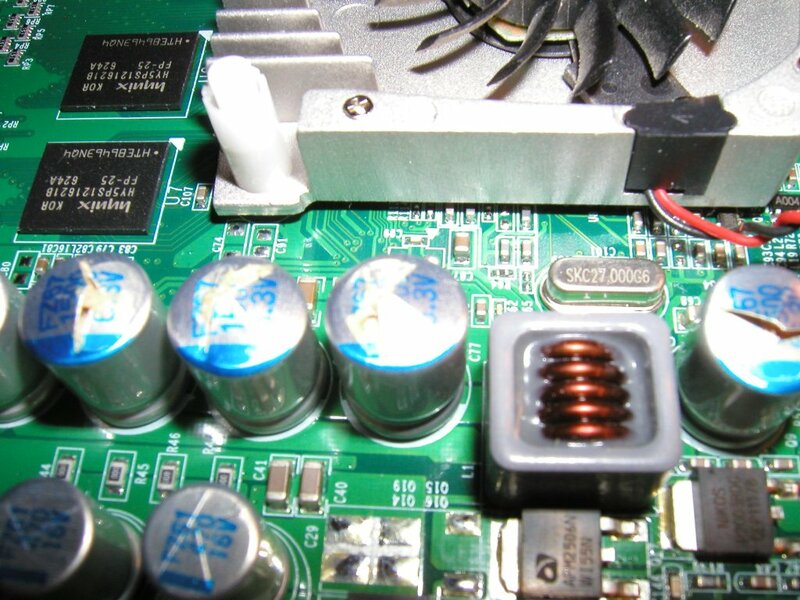 The exact same problem as you – exactly the same capacitors have burst – after 4.5 years. 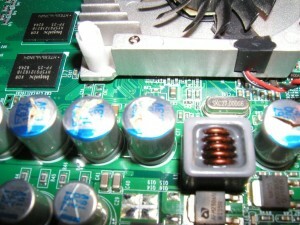 But, another capacitor, at the edge opposite the VGA connectors (there’s 2 there), the one closer to the edge, has also burst. Did that one also burst for you? I did hear pops – but I didn’t think it was coming from my computer! My god! Elsewhere on the ‘net I read that the caps are “electrolytic” and not “solid” caps, but they are painted to look like solid caps (no plastic cover, the blue crescents). I wonder if this is an EVGA problem? And what’s that copper-coily-thing-in-grey among the capacitors – the top of it seems melted, just as in your pics. Ps. What video card do you have now and did you buy it after good research? How is it performing now? It certainly seems you got more use out of your card than I did! Mine lasted about 3 years. I replaced it with another EVGA that I only used for two (I didn’t want to purchase that same brand again, but it was on an emergency basis and was the only one the local store had in stock that was NVIDIA-based). 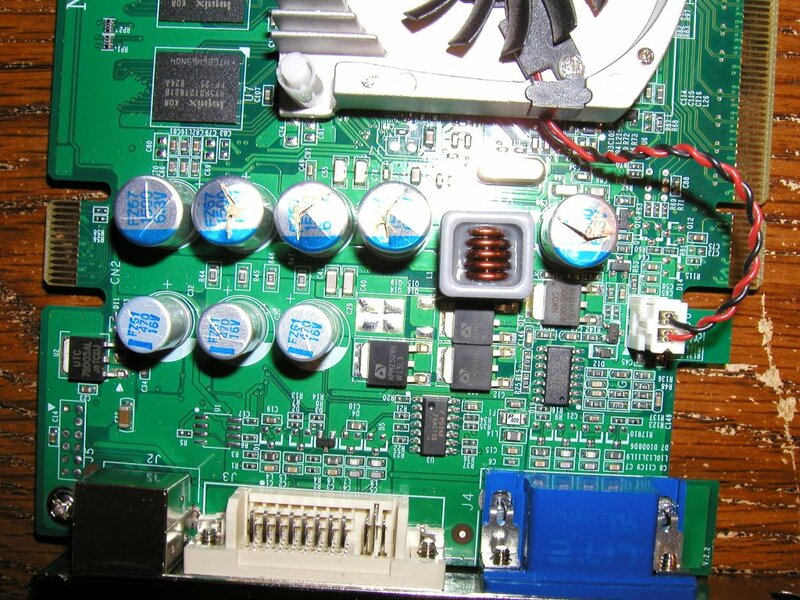 My second EVGA card worked quite well, but before my latest build (May of this year, 2011), it was causing me similar grief possibly due to the PCIE power connector either not fully connecting or due to the power supply connector. I’m not 100% which because the problem was so intermittent. On the plus side, most solid state capacitors I’ve seen in the last couple years have all been square, so they’re fairly easy to spot! The copper coil is an inductor of sorts and is most likely a choke coil. See here for a brief discussion about someone inquiring how to replacing one. It’s not melted, though. I believe that it’s actually embedded in epoxy in the 7600s that happens to be colored gray. Currently, for my new build, I’m using a Zotac (450 GTS) card. It was a toss up between MSI, Gigabyte, Asus, and Zotac. I wasn’t willing to spend a whole lot on the card as I’m not a huge gamer, and the MSI cards at the time had complaints related to noisy cooling (big minus). So far, the Zotac seems to be holding up quite well, but I’ve only had it for the whole of about 3 months. It runs a little cooler than my last EVGA card (9600 GSO) at 65C under heavy load versus almost 71C (!) but seems to do well. I needed it mostly for the dual DVIs, and it was reasonably inexpensive. I may replace it down the road with a more powerful one, but it does quite well and the heat sink seems better designed than the two previous EVGA cards I’ve had. The one on the 7600 was a joke.